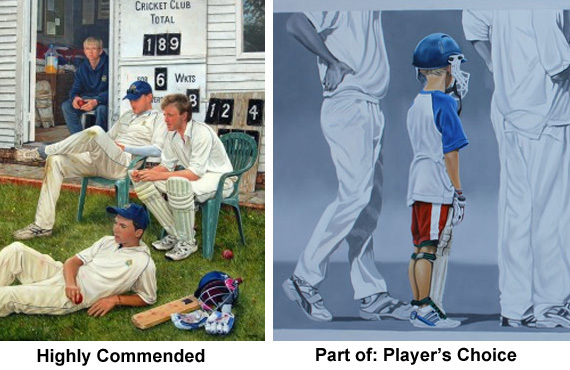 Cricket Art Prize 2012 displayed in the Greats of the Game Gallery | The International Cricket Hall of Fame. The Bradman International Hall of Fame is hosting the Cricket Art Prize for the fourth year in a row. Forty original works from Australia and overseas are on display. The works were first displayed at the Sydney Cricket Ground in October 2012. The artists’ highlight the breadth of cricket from tense moments in international games to family matches at home or on the beach. All celebrate the game for its characteristics of uniting people creating lasting positive memories. The artists depict how playing cricket suspends time in an increasingly frantic world and how it can celebrate unique landscapes and humanity. Works on display include the 2012 Cricket Art Prize winner, ‘Great Depression – Leg Theory’ by James Powditch, runner up ‘Next Man In’ by Geoff Tristram and the evocative reflection of childhood memory, ‘The Next Generation’ by Margaret Ingles. The Cricket Art Prize is on display until Sunday March 6, 2013. Bradman Experience Ambassador entry is free to the Museum. Contact us to see how to become a Bradman Ambassador on 4862 1247.